In my last newsletter, I mentioned that we’d be launching at Baselworld a new Performance Art series in collaboration with a “brilliant artist”. Well, the star of the show was the unclassifiable, undefinable designer James Thompson, aka Black Badger. Born and raised in Canada, now based in Sweden, James has developed the rare know-how – among other talents – to literally sculpt solid light, in the form of high-power luminescent material. I met “the Badger” a few years ago, during Salon QP in London. 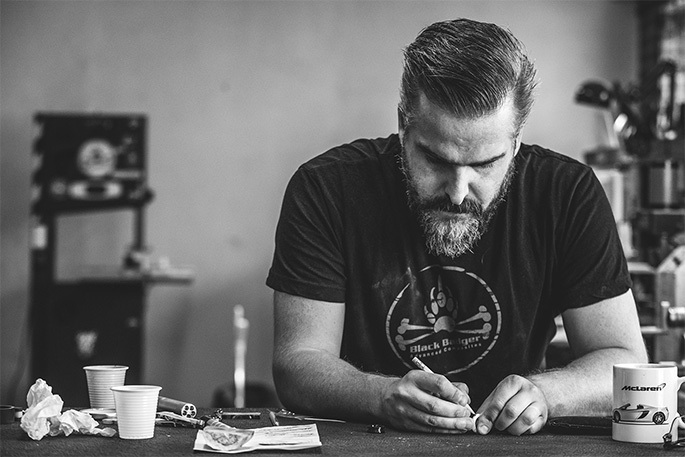 He had just dipped a toe into a first watchmaking project, but more importantly, James was a very interesting, creative and unconventional guy – we got along right away. We stayed in touch while he explored the potential of glow-in-the-dark materials, working in particular with a Canadian company called Ambient Glow Technology and their high-efficiency lume called AGT Ultra… One thing led to another: a few years later, here we are with not just one, but two “Black Badger” Performance Art series! 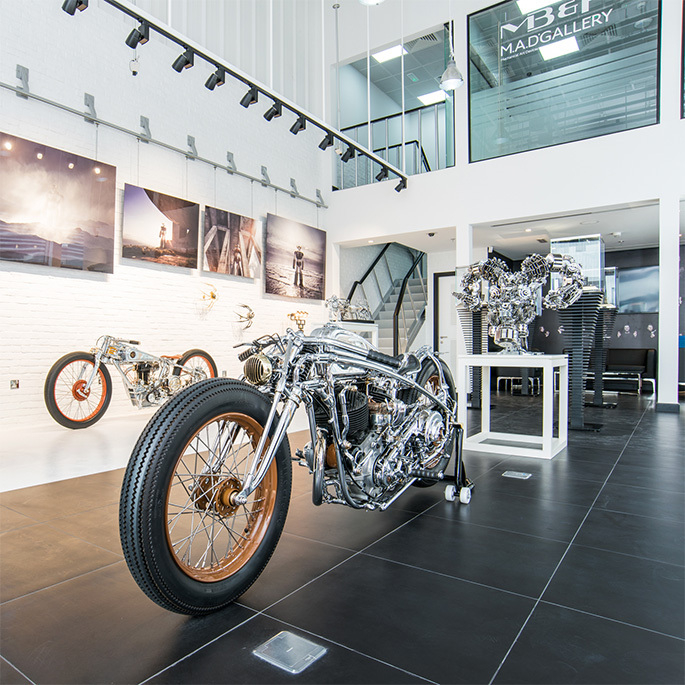 When we first started working with James, he was naturally attracted to HM5 ; among other reasons, because he’s been involved with quite a few projects related to motor-racing and high-performance sports cars. A lot of his initial ideas were a bit over the top: in his own words, too obvious, too blatant. But he gradually refined his approach… and realised it would be amazing to actually inject light into the very heart of one of our machines. For this, a better candidate surfaced: HMX. Also totally car-inspired, but with a very “open” case design, giving a great view right into the HMX engine. 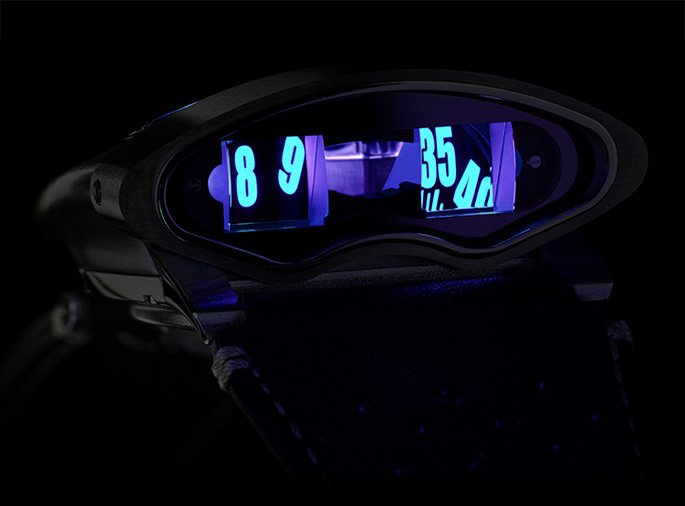 That’s how the HMX – first launched last year for MB&F’s 10th Anniversary – received a pretty massive injection of glowing light. Not on the surface, on its dial or case as one might have expected, but right at its core, on the movement itself. 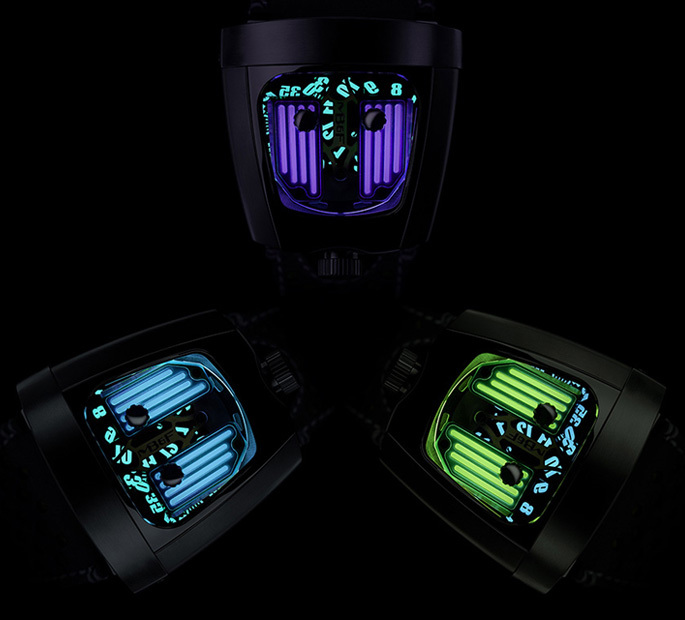 The “rocker covers” of the HMX engine are now crafted from solid blocks of Black Badger’s unmistakable lume: during the day, you might think you’re looking at a standard HMX, but at night those rocker covers light up in a choice of three colours – dubbed Radar Green, Phantom Blue and Purple Reign. Each variant is limited to 18 pieces. Inside the grade 5 titanium and stainless steel case, you’ll find the combination of mechanical and optical engineering that make the HMX (and HM5) so unique in the watchmaking world. The automatic movement’s jumping hours and trailing minutes are actually laid out horizontally, on two discs lying flat in the movement; but the numbers are projected vertically and magnified by an optical-grade prism system in sapphire crystal. The result is a true driver’s watch, with lateral time display. You’ll find all the details about the HMX Black Badger on our website. As mentioned, for this new Performance Art series, James Thompson has reinterpreted not just one, but two of our Machines. 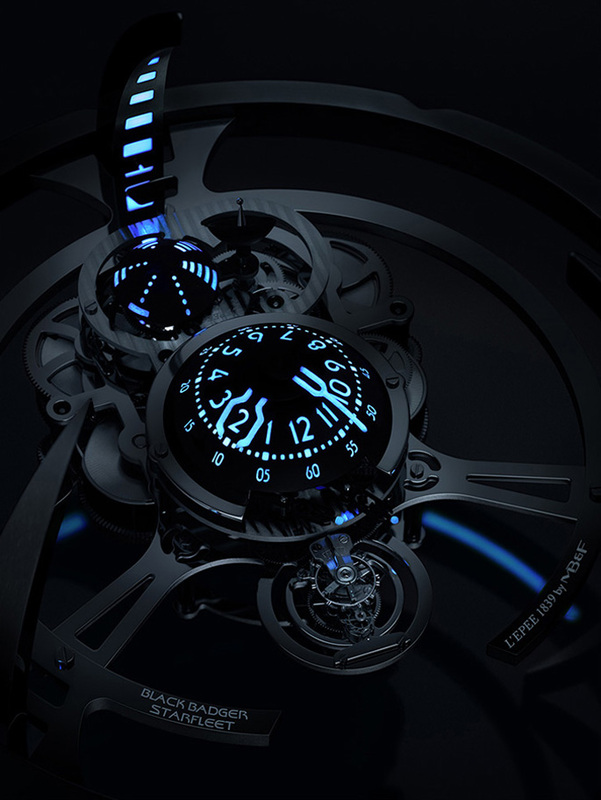 For extra fun (I told you he’s different), James suggested adding his powerful lume to another, totally different timepiece: the Starfleet Machine Black Badger. The original Starfleet Machine was our first-ever collaboration with table clock specialists L’Epée 1839. Conceived by MB&F and engineered by L’Epée, it was first launched in 2014 for the venerable Manufacture’s 175th anniversary. The high-precision table clock boasts an amazing 40 days (yes, days!) of power reserve, thanks to a beautifully finished, five-barrel movement. 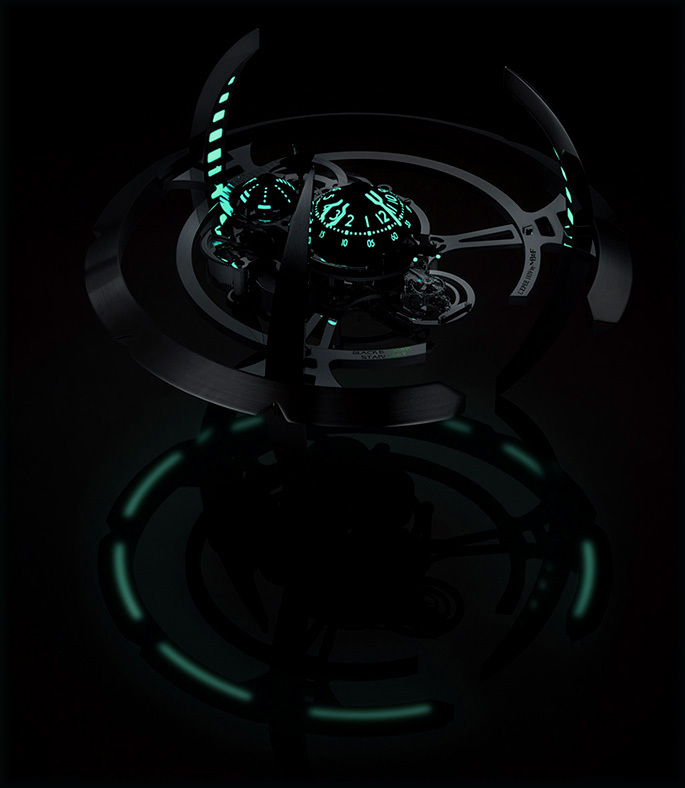 Designed like a space station, Star Trek fans will immediately recognise the “Deep Space Nine” inspiration… Black Badger has given it an extra dose of sci-fi vibe, integrating his amazing glowing lume in the Starfleet Machine’s structure and indication domes, thrusting it resolutely out of this world. Like the HMX, this new Machine is available in Radar Green, Phantom Blue and Purple Reign (also 18 pieces each). Like these just-released Black Badger editions, the various Performance Art projects we’ve worked on since 2009 have always been extremely satisfying: a bit scary sometimes – it’s never easy to hand your creations over to another artist! – but always loads of fun. And the final result has always surprised us, exceeding our expectations. Guess what: there’s more coming! On this Wednesday, May 25th, at 14:00 CET. Want a hint? Well, the majority of our Performance Art wristwatches so far have been based on Horological Machines. Just once did we venture into our more classic Legacy Machine territory: with the delightful and rather subtle LM1 ‘Xia Hang’. The new release will once again revisit the LM1… in a definitely less subtle way. Stay tuned! I mentioned it briefly in our last newsletter, but you may have missed the news: we have officially opened our third M.A.D.Gallery in Dubai, after the original gallery in Geneva and a second one in Taipei. The gallery is managed and operated by our long-standing retail partners and trusted friends Seddiqi, who have represented MB&F in Dubai from the very beginning of our adventure. 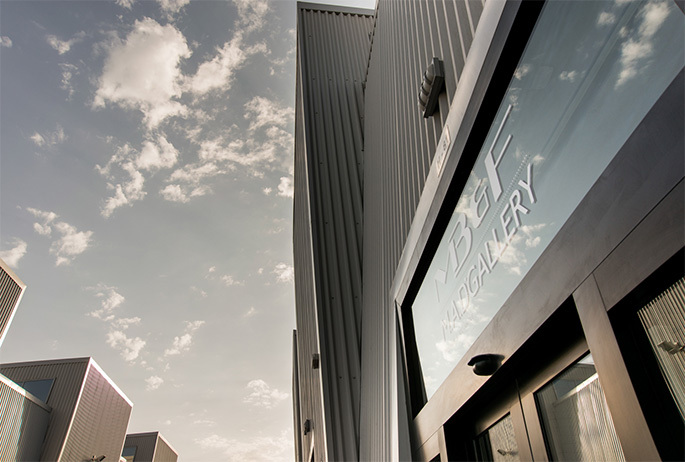 The gallery is located on AlSerkal Avenue – a very cool contemporary arts hub regrouping several art and design galleries along with other creative businesses. Don’t hesitate to drop by if you’re in town! Like our other galleries, you’ll discover our Horological and Legacy Machines – including the recent LM1 M.A.D. Dubai, a 13-piece limited edition available exclusively at our Dubai location – but also a selection of amazing mechanical and kinetic artists from around the world. By the way, zipping back from Dubai to our home base: if you’re in Geneva on June 16th, you MUST join us for a very cool event called “Les 100 mètres de la Rue Verdaine”. In a nutshell, we shut off the old town street where the gallery is situated – Rue Verdaine, about 100 metres long – and all the street’s boutiques open their doors (and offer a drink or two) to their guests. It’s open to the public and a great way to kick off the evening, so grab your friends and be there on Thursday, June 16th!